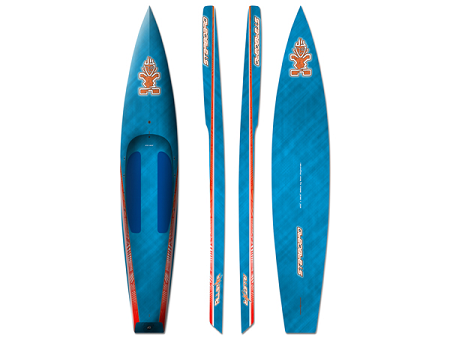 > Starboard All Star 12'6"x28"
"It feels like you're paddling downhill"
Creating a race board for the world's fastest and most demanding race team is a challenge. There is a legion of considerations when creating a versatile race board. WHAT CREATED THE MAGIC IN THE 2014 ALL STAR? Lower rocker for more speed, bottom contours that create lift to enable a board to go to glide, a nose that pierces rough seas and surf but also lifts so you don't steer from the bow. 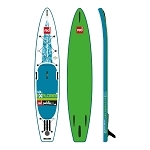 The 2014 Starboard All Star rounds a buoy fast and is quickest to go to glide, they call that “coming out of the hole.” When you combine a sleek outline, complex concave bottom, independent rail and center rockers, round-to-tucked sharp rails and a volume distribution that creates a balance point, it allows the paddler to minimize displacement/disturbance and maximize their stroke. 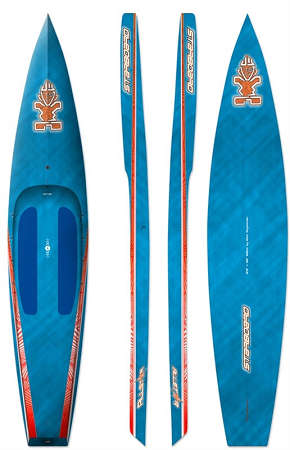 From that flawless balance point comes a board that allows you to paddle longer on one side, track through quartering wind to stay on the mark, run the bump, increase your stroke turn-over and hold top speeds with less effort.